The Raptor visitor badge holders can be paired with the Raptor lanyards or can be used as a standalone badge. 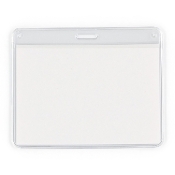 These badge holders can help easily identify visitors, contractors, visiting teachers, and anyone who comes into your school or district. One order comes with 24 badge holders.